Baby it’s cold outside! It’s snowing as I write this and believe me, these cold temperatures will ruin my skin for weeks and I will have to resort to rubbing E45 on my face before leaving the house. Luckily, this year, I discovered these amazing amazing products from Japanese skincare brand DHC which have saved my skin. 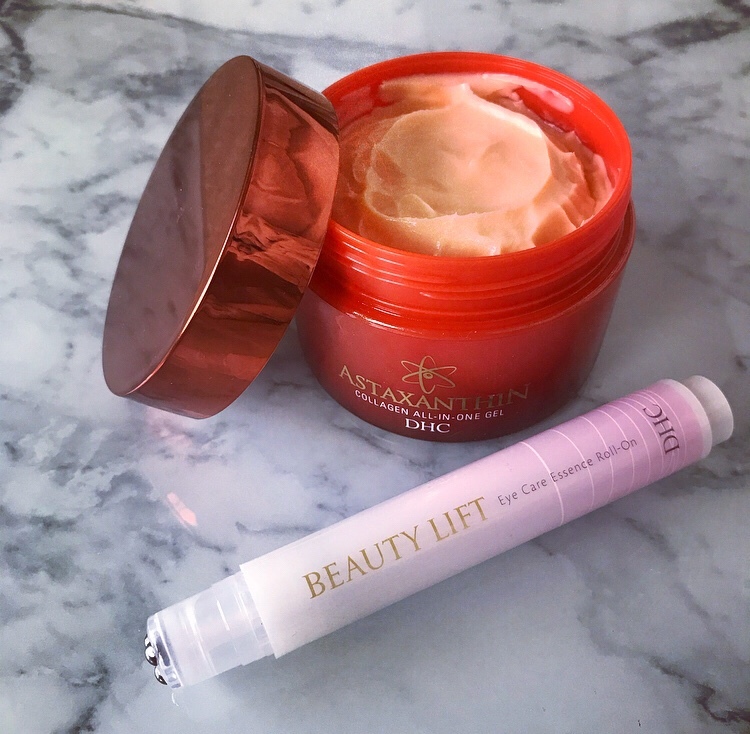 This DHC Astaxanthin Collagen All-in-One Gel is a super rich and hydrating cream which is amazing for the winter. It’s a gel but comes on like a cream to nourish skin yet doesn’t feel heavy on the skin. When you feel grey in the winter, this will brighten as the antioxidant Astaxanthin,derived from freshwater green algae is a vitamin-like substance considered 6000 times more powerful than vitamin C. It also tones, hydrates, while fighting free radical damage and forms a barrier against the elements. I have to admit, it smells funky, but it has made a difference to my skin over the last few weeks and I will continue to use it for the rest of winter. Okay so this DHC Beauty Lift Eye Care Essence Roll-On is not only an eye cream, it smooths out your bags or puffiness and gives your eye area a massage. My eye area is sensitive and I react to most eye creams but this has been amazing! It feels lightweight and great on the skin.The massaging beads cool and stimulate the delicate skin around the eye, so great for first thing in the morning, when your eyes are feeling puffy. It’s amazing, I love using this product! The eye treatment contains oat kernel extract that firms and smoothes, the firming power of mevalonolactone, ceramide 3, and pentapeptide-18 to hydrate and lift. All you do is click for more product and you don’t need much for your eye area so it lasts a while. My eye area has stayed smooth and bright this winter so I would highly recommend this product. Also, did I mention that they are Japanese? Always trust the japanese when it comes to skincare and ageing as they seem to hold the secret to looking incredible.